Subic Bay Metropolitan Authority, SBFZ- Olongapo will be celebrating it's 23rd year and alongside is the month-long activites. 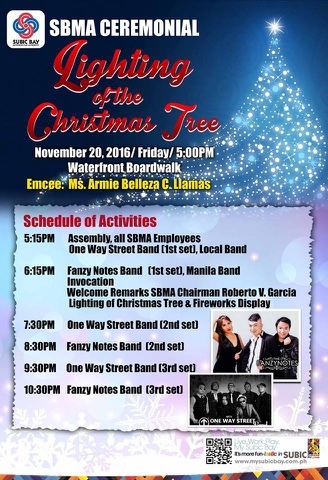 Plus, one of the highlights of the event is the Ceremonial Lighting of the SBMA Christmas Tree at Waterfront Boardwalk. There will be music bands from Manila and also trade and food bazaar for the public. The November celebration will end with a Subic Color Run on November 29. You are invited to witness and participate in our various events this November as we celebrate SBMA's 23rd Anniversary! For more details, please call the Tourism Office at 047.252.4197/ 4154. 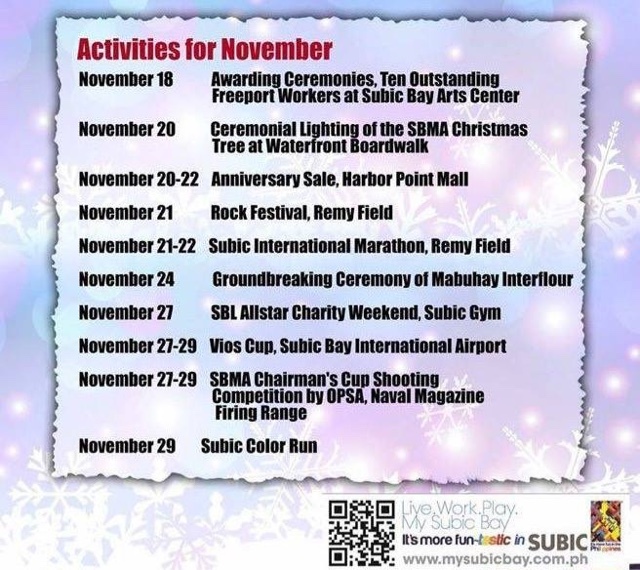 Drop by Subic Bay and enjoy a weekend of fun, music and let's start the merriment season.